“Your antagonist is fear,” she said. She is one of the insightful people in my writing critique group of seven people, all bound to help give birth to our respective books. For my submission last week, I turned in some preliminary writing that was more brainstorming and plotting than actual prose. I hoped for encouragement. I was shocked. This was not at all the kind of feedback I was expecting. I left the meeting feeling hurt, called out, and pissed off. I cried in the car ride home. But after a few days of thinking, I realized she’s right. Though I hardly ever listen to the radio, I turned it on yesterday and Sara Bareilles’ song Brave was on. Have you heard it? It’s amazing. Honestly I wanna see you be brave . . . Okay, Universe! I get it! Reading about someone’s writing process can be as fun as watching them gaze at their own navel. I won’t belabor my point, but I will say this: Telling the truth is HARD. No less than three people have asked me in the past week, how do you do it? How can you write about real people you know? Don’t you worry? I worry about making my partner look like a schmuck (which she most certainly isn’t). I worry that “Meg” will never speak to me again. My mom and aunt read this blog, as do some of my clients, my boss, and many friends—both from the Camino and at home. I worry about what they will think. Despite the pressure I feel to say everything nicely and keep topics unoffensive, I have to be brave. I have to fight my lifelong urge to be tactful. I have to just tell it like it is. Here’s why: I’ve met too many pilgrims who went into their journey hoping to be changed by it, and did not know how to sort out the experience afterward. Telling the truth is a gift to myself and—hopefully—to anyone who struggles after their Camino. I’m taking a week to work on my writing and may not update the blog for a bit. I’ll be back with more tales that aspire to inspire. It’s not ALL hard or scary, though! 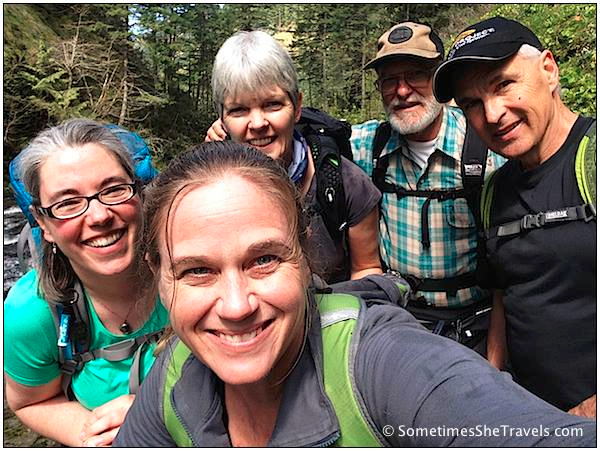 In the last week, I’ve taken three different hikes with wonderful people. Getting outdoors is awesome nourishment for the heart and soul. The first hike was a fourteen-miler on Eagle Creek with new Camino friends—including one of my favorite bloggers, Elissa Green from sometimesshetravels.com. 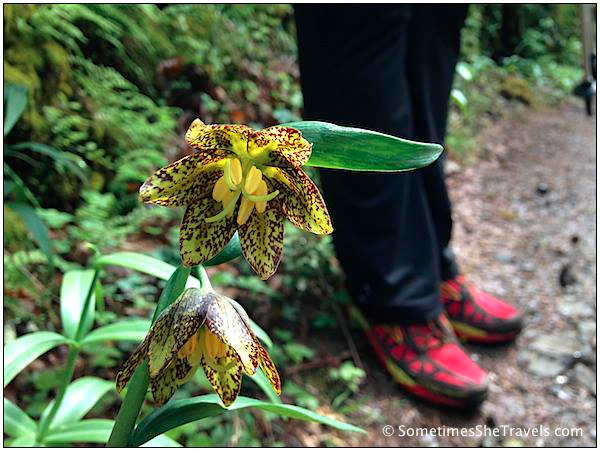 I loved this photo Elissa took of my favorite hiking shoes (Brooks Cascadias) and a Checker Lily. Then! 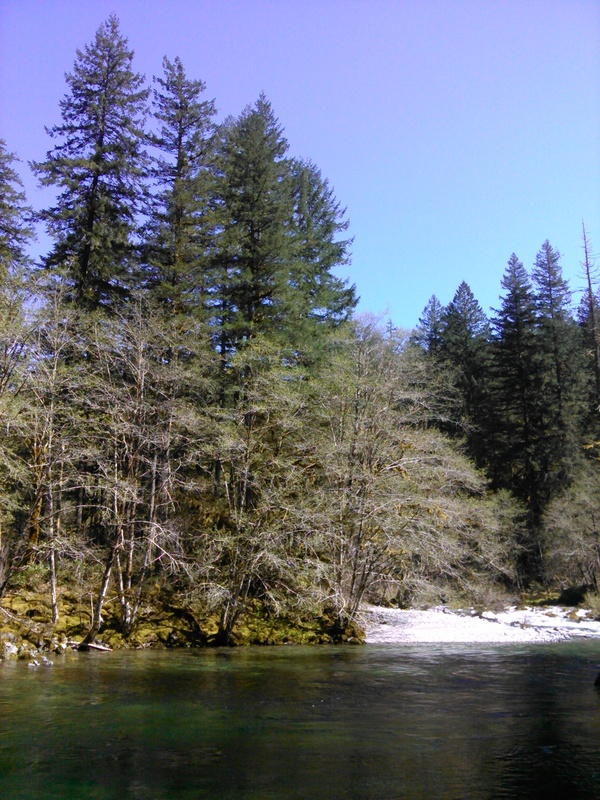 Mary and I took a hike on Saturday in the Opal Creek area on a gorgeous day and saw tons of wildflowers. 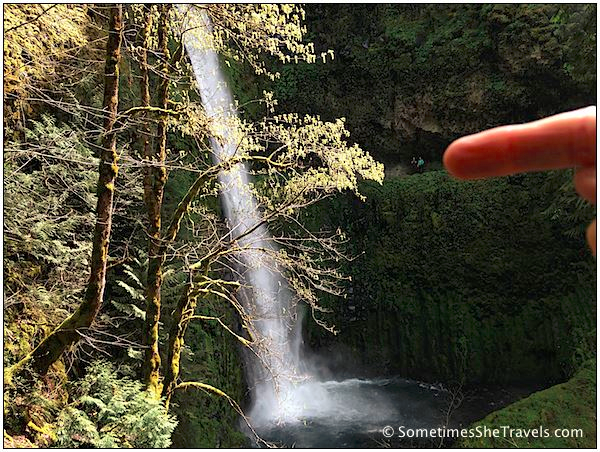 At one point we could hear the rushing sounds of three separate waterfalls. Amazing! 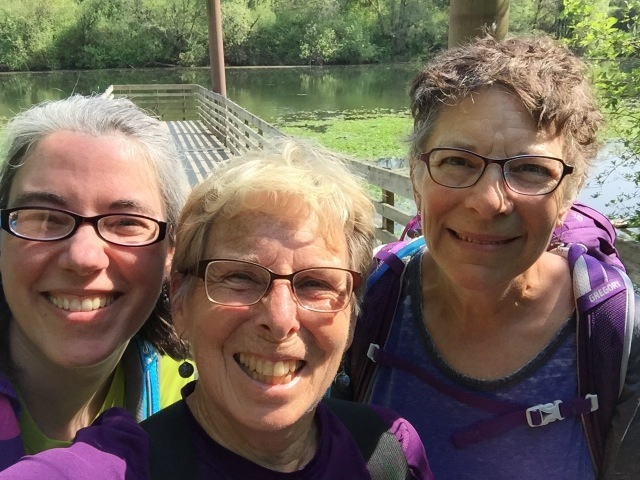 Last, I met Carol and Nancy (more Camino friends) for a hike around Willamette Mission Park. We talked gear, albergues, and life. Such fun! I counted—that’s about 23 miles in one week. Yay! Let’s get out there be brave together! You ARE brave, and beautiful inside and out! And only you can decide what are your limits… No need to show you naked for the sake of it. Thank you for this, Muriel. I so appreciate your insights—as always. I would not get “naked” at all if my ego had any say in the matter. 😉 For my own sake, I want to dig down to the bottom and discover what is there. If it’s useful to others, I will bring it back to share. You’re the best, amiga peregrina. I love reading about the process of other writers, but then again, it’s because I’m attempting to do this writing thing myself. I’ve said this before, but this post brings it up for me again… I truly appreciate how difficult it is to push past the fear in your writing and to be so open and vulnerable with your words. You are getting this in a way that I can only hope to aspire to myself. So keep pushing Jen, keep being brave… you’re already well on your way. Happy writing this week!! Thank you, Nadine. It means a lot to know you get it, and I’m encouraged to know you’re working on finding your own words. I hope we get to read them! I love the way you write. It feels like I’m sharing the same space with you. Telling the truth is the only way to go. Anything else is lies. You know this. I know this. Like you I’ve published posts that I could hardly believe I was revealing what I was revealing. Terrified. But they’re the posts most people relate to – the human, truthful, authentic ones. They’re the only ones that matter really.Telling the truth is a gift for everybody. It’s the only gift. Thank you for telling the truth!